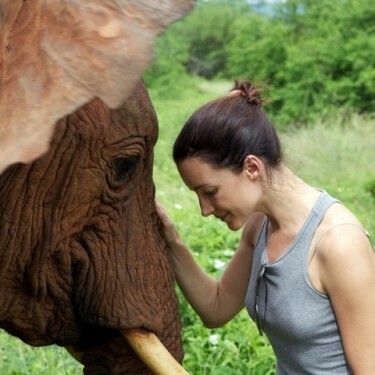 Promotion: Donate at least $20 from 9/2 at 9am ET to 9/5 at 11:59 pm ET and you’ll be automatically entered for a chance to win an Autographed Photo of Kristin Davis and an Elephant. Did you know that elephants will soon be extinct? Every 15 minutes an elephant is brutally killed for it's tusks. Everyday elephants are being attacked by poachers with poisoned arrows, spears, deadly snares and guns. The David Sheldrick Wildlife Trust is fighting to protect these majestic animals in Kenya everyday. Our anti-poaching teams need a helicopter to respond quickly to wounded elephants and to catch the poachers and have them arrested. Every dollar raised goes directly to the efforts of the DSWT team on the ground in Kenya. We are in a crisis because there isn't much time to save the elephants. Organized criminal and war lords like Joseph Kony are killing elephants to fund their illegal activities. So not only are we in danger of loosing a beautiful , intelligent animal, but more innocent people will suffer because of the money made from selling the ivory on the back market. We must fight together against the bad guys before they win and we loose the elephants in the wild forever!